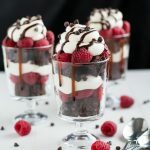 Nothing says “love” like these Raspberry Brownie Cheesecake Trifles made with rich chocolate made-from-scratch chocolate chip brownies, easy no-bake cheesecake filling, and fresh sweet raspberries. 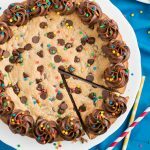 Pin it to your EASY DESSERT RECIPES board to SAVE it! Everyone loves hearing a good embarrassing story, right?! Well here is one for you! We recently had a snow storm last week in Omaha. The next morning I had an appointment so I went out to the car with a couple extra minutes to spare so I’d have time to get all the snow and ice removed. I unlocked the door with the remote so I could grab the windshield scraper but when I pulled the handle to open the door it just wouldn’t budge. I tried all the other doors, pulling with all my strength, hoping I wouldn’t break a handle off. My husband had a “snow day” so I came back in and told him the doors were frozen shut and that he needed to open it. He went out there and came back fairly quickly and said it wasn’t stuck at all. Turns out I was trying to open our neighbor’s car parked next to ours. Good thing I’m not strong enough to break the handle! Oh, I can’t wait for the day when we have a garage and I don’t have to worry about scraping snow off the car or accidentally trying to break into my neighbor’s car. 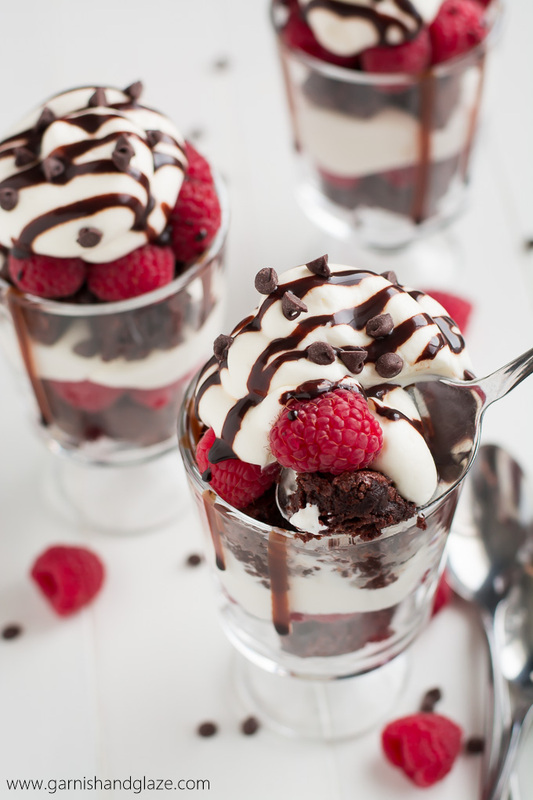 On another note, these Raspberry Brownie Cheesecake Trifles taste like heaven. 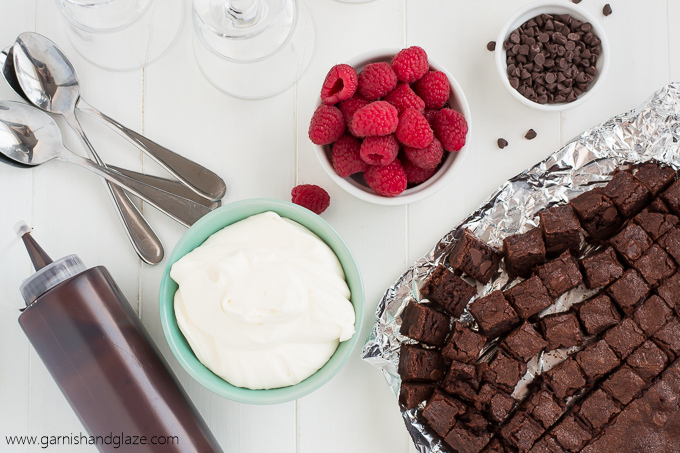 It’s like my three favorite things all in one dessert!– brownies, cheesecake, and raspberries! Oh, and chocolate (chips AND syrup!). The great thing about these trifles is that you can prepare everything ahead of time and then just assemble it right before serving. And the cheesecake filling doesn’t have to be baked! Oh and you’ll only use half the pan of brownies (which have chocolate chips in them!) in the trifles which is good because then you have the rest to snack on… and believe me, after cutting them into small bite size squares, it’s almost impossible to not snag a few ten of them while assembling. You can make one big trifle but I love making them in cups so that it’s already portioned. When scooping trifle from a big bowl it’s very tempting and easy to go back for seconds and thirds. Yeah, you know what I’m talkin about. The cheesecake filling is made using just cream cheese, sugar, and whipping cream. 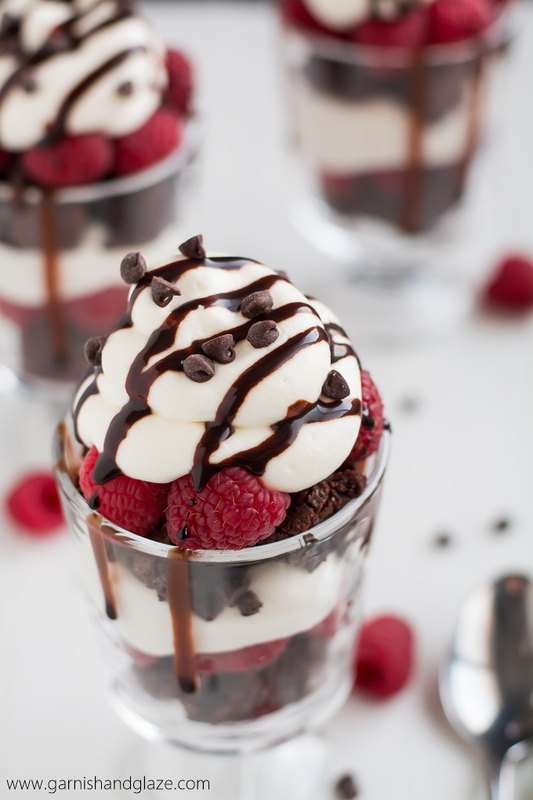 It has the tangy cheesecake flavor but the whipped cream makes it less dense, pairing perfectly with the rich brownie and raspberries. 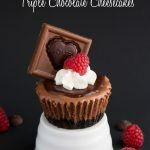 If you’re looking for the perfect dessert for Valentine’s Day, these Raspberry Brownie Cheesecake Trifles are it people! Large Piping Tip: This tip is huge. Perfect for piping whipped cream, frosting,… anything. 8×8 inch Baking Dish: I love this one because it comes with a lid so you can stack things on top of it. Mini Trifle Dishes: The ones in the photos are actually from Ikea but these are similar. Mini everything is just so much more fun, right? You can also use regular drinking glasses or just make one giant trifle in a regular size trifle bowl. Preheat oven to 350 degrees F. Line an 8x8 inch baking dish with foil and then lightly coat with cooking spray. In a mixing bowl, whisk sugar and cocoa together. Mix in the melted butter, vanilla, and salt. Beat in the eggs and then mix in the flour until just combined and then stir in the chocolate chips. Pour batter into the pan and bake for 27-30 minutes, until toothpick come out clean. Cool to room temperature before cutting. Cut into half inch cubes. 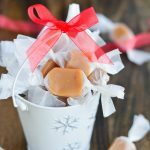 Beat cream cheese and sugar together using a standing electric mixer or electric hand mixer. Slowly pour in the whipping cream while mixing. Beat until stiff peaks. Assemble the trifle with a layer of brownie cubes in the bottom of the trifle dish(es), some fresh raspberries, spoon or pipe on a layer of the cream cheese mixture, and repeat. Drizzle with chocolate syrup and sprinkle with chocolate chips. Serve immediately. 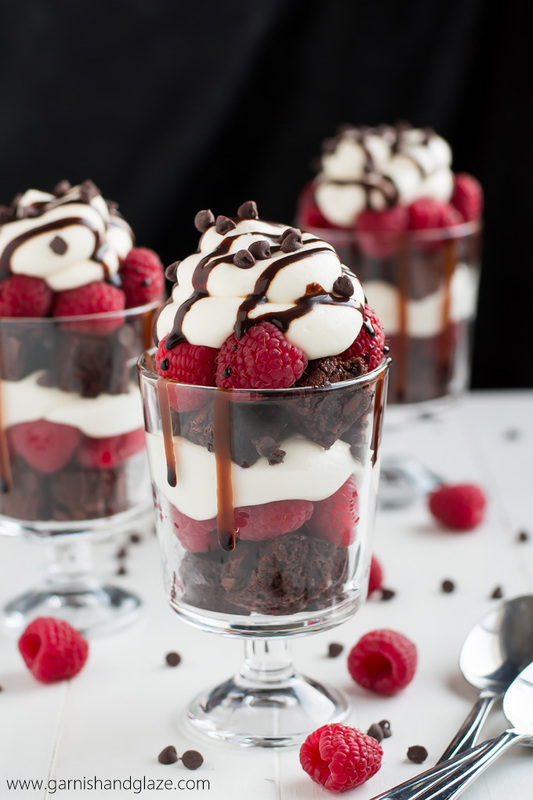 These trifles look incredible! I need them in my life…. now! Gorgeous!!!! Frozen doors…what a hoot! LOL!! Thanks for sharing. 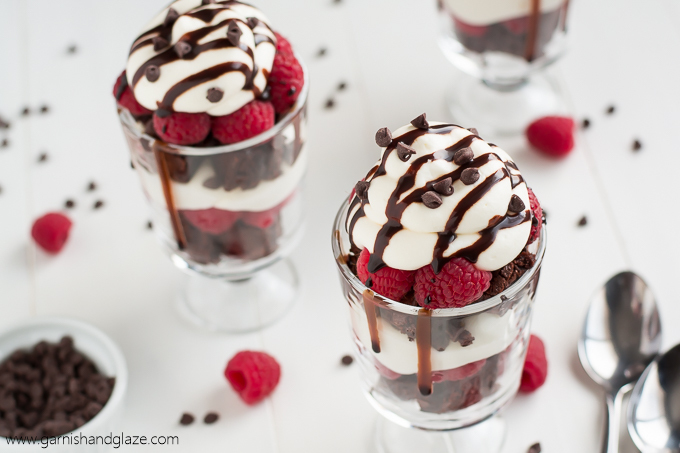 Trifles are totally my favorite dessert–so easy, and so elegant! These are so completely gorgeous, I’m smitten! PS That story is exactly like something I would do…haha! Funny story! When in high school, parents would wait in their cars in a line to pick-up their kid. I thought I saw my mom’s car, so I opened the back door, tossed my backpack in, then opened the passenger door and got in. I looked up and noticed it wasn’t my mom! SMH!!! Haha! That is too funny! My brother and I did something similar to that… but we were in elementary school. One day I was picking up my son from work and I saw him go pass my car and open the door of someone else’s car so I called him and asked him what was he doing. He said oh the lady looked like you and the car looked the same! Thanks Alisa! Your family will love them! 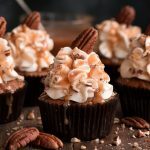 Can these be assembled and kept in the fridge at least a couple of hours before serving? Laura, Definitely! I would wait to drizzle the sauce on top until serving though.